It was very difficult for me to decide what to post this week for the Wildflowers in Winter event that Elizabeth Joy is conducting at Wildflower Morning. Her theme this week is wildflowers in the home. As I looked around my house, I discovered that flowers of some sort are everywhere and many of them are wild! I probably come by this naturally, as I grew up in a home where flowers were highly valued and always present. I never thought about it very much, but accepted it as a fact of life and adopted this pattern in my own home --- until a friend who visited frequently made a comment about all the flowers in my house. She doesn't like flowers and has none in hers. Her comment stopped me in my tracks! I can't imagine living without the beauty of flowers to cheer each day. 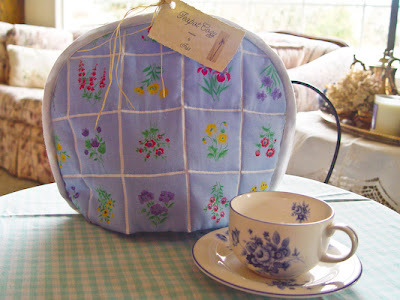 The first item I selected which incorporates wild flowers as part of home decor is this pale blue tea cozy with an assortment of wildflowers in a checked pattern. It goes well with my blue and white teacups and teapots. 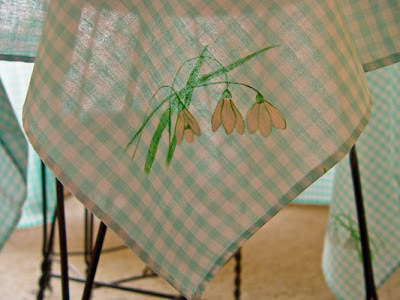 I looked around some more and found this luncheon set; a tablecloth and napkins made by my mother. 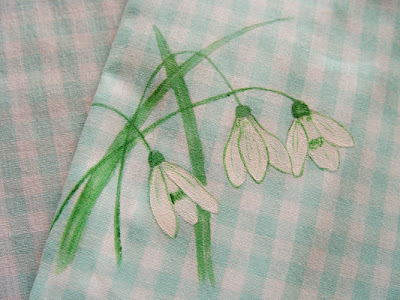 She painted snowdrops on each of the four corners of the tablecloth and on each of the napkins. She painted eight or ten flower luncheon sets (for tea parties) and each one features a different flower, but I think this one is my favorite. Looking further I found a sign painted on a heart-shaped, carved stone. I usually keep it on a hook outside my back door but have it inside for the winter to protect it. 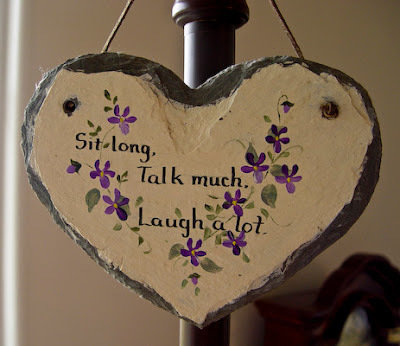 It's message of "Sit long, talk much, laugh a lot" was also painted by mom. And how's this for an oldie? My mother kept this picture of me on her bedroom wall. I was in my early twenties when this was taken. The location is Mount Rainier National Park, in one of the meadows on the mountainside. My sister and I both wore our long 'granny dresses' for the photo shoot. We felt somewhat strange being dressed up when others were wearing shorts, tank tops, and tennis shoes! This is one of a two that mom also made. 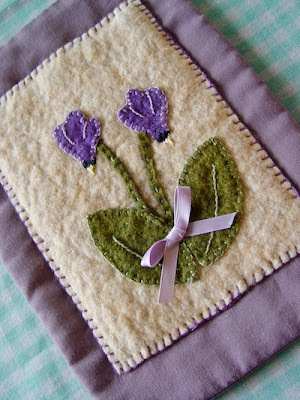 They are felted wall hangings of shooting stars. Sometimes wall space becomes sparse, so these could also be used for hot pads. I think this would be pretty on a lavender tea table and a nice place to set a teapot. I couldn't stop here --- so I'm doing one more post on this subject --- to follow below. I don't think I've so many wildlfowers in my house as you have ..
so glad i took a coffee break to pay a visit. lovely, lovely site...i love your theme: creating a home a welcoming home. Love the photo of you beneath Mount Rainier...it's idyllic. Glad to find wildflowers blooming somewhere! I love seeing the things your Mom created -so much talent! And that photo of you is so NEAT! Having done a lot of hiking around there, I can just imagine how awkward that was at the time, but what a perfect photo backdrop! Love the flowers and the tea cup is beautiful. The picture of you is wonderful .. so incredibly special. Oh and the snowdrops were my mom's very favorite. I can't imagine any spring time without them. I enjoyed seeing all these lovely things! I love the photo of you by the mountain! 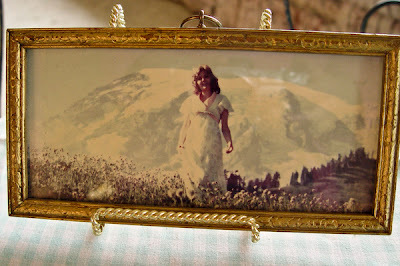 I also wanted to say that the shot of you in the meadow with Rainier in the background is a wonderful photo. I enjoyed seeing all these lovely flowers around your home....and that photo is great. At first I thought it was a painting...beautiful. Thanks for sharing a little of your Mom with us. Priceless! I love that picture of you!! Oh! 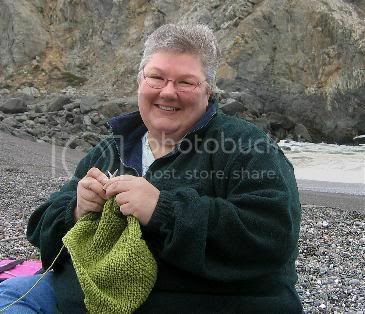 What lovely treasures made by your mom...I can see where you get your talents and great taste in beautiful things. I especially love the photo of you beneath Mt. Rainier...oh! and I can identify with those dresses...they were the rage at one point...weren't they? What a beautiful entry on wildflowers in the home. Your embroidery of the morning glories is exquisite! I love everything you've shared, but I especially liked the picture of you in a field of wildflowers. Mom was smart to keep that hanging up all that time. What great towels and I love that picture!!! !